Vertex Introduces eVerge EVX-531 Digital VHF/UHF 2-Way Radio | Magnum Electronics, Inc.
With the introduction of the commercial mid-tier EVX-530 series, analog 2-way radio users now have a lower cost solution to start upgrading to digital communications. The EVX-531 can be programmed to your same analog channels but can be changed to digital when ready. You can even program both analog and digital modes in the same radio with scan. 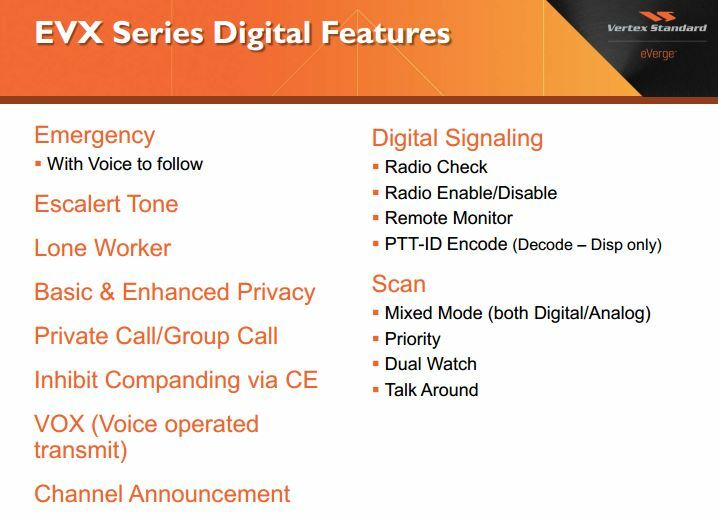 Basic digital voice features will significantly improve your organizations’s communications and now the Vertex eVerge DMR platform makes it very affordable. We expect many manufacturers to cancel their analog-only radio models starting later this year. The EVX-531 is not an entry-level radio. Based on the VX-450 platform, the 32 channel basic model carries a IP57 submersible rating, emergency functions, and a three year warranty. Additional display models including an optional Factory Mutual intrinsically-safe rating will be available later this year. VX-451, VX-454, VX-459 radios use the same audio accessory connector, battery form factor, carrying cases, and chargers. The DMR digital platform has become the preferred standard over NXDN during the past five years. Motorola MOTOTRBO digital radios and others continue to dominate DMR digital 2-way radio sales resulting in 7+ out of 10 radios using the DMR standard. The EVX-531 specifications show a 31% increase in battery life as compared to the same radio in analog mode. The high-capacity FNB-V134LI battery will provide almost 16 hours of operation in digital and 12 hours in analog mode. 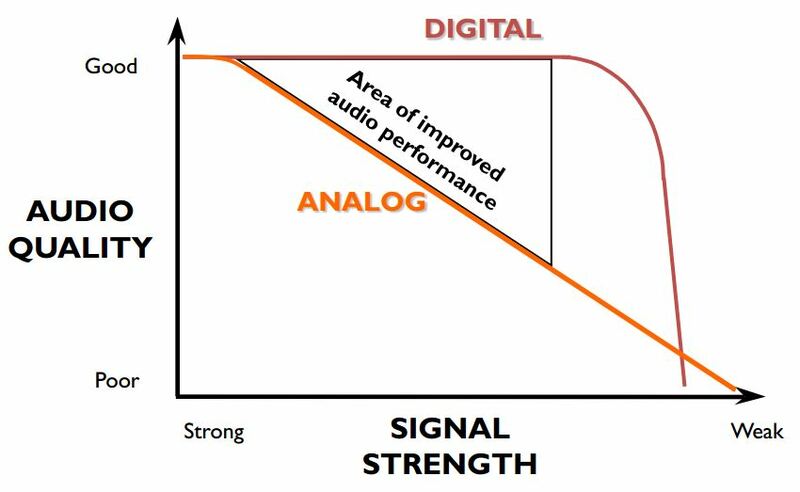 Digital audio quality exceeds analog especially as the signals become weaker. Many users who narrowbanded their radios experienced a 10-15% reduction in usable coverage. If you have to repeat messages or frequently operate at the edge of radio coverage, switching to digital may be a good solution. In addition to all and group calling, the Vertex EVX-531 can be programmed for private one-to-one conversations. Emergency and lone worker features are standard and will improve the safety of your employees. Also, radio-to-radio cloning is possible using the Vertex XURTS0008 CT-27A cable. This entry was posted in New Products, Portable Radios, Vertex-Standard and tagged 2-way radio, communications, DMR, eVerge, EVX-531, Vertex-Standard by magnumelectronics. Bookmark the permalink.